Sarah was content—or so she’d thought. Numbly going through each day believing she didn’t need anything more, she hadn’t been looking for love. Not until she met a real estate agent that sent her belly spinning with unexpected thrills. What will she do with the man who sent her life into a roller-coaster ride she couldn’t control? Scott was busy. The family business was running him ragged and he had barely enough time to keep his sanity. But some distractions cannot be ignored, and Sarah was too tasty a morsel to overlook—each nibble just made him want more. Could he convince her that he could give her what she never thought she’d needed? 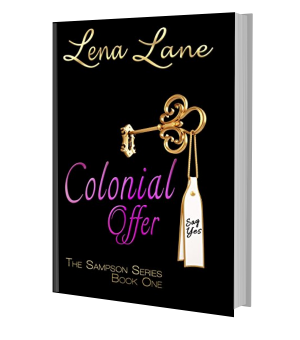 In their real estate world where bids are often rejected, will she accept his final offer? Lena has been writing since high school—though that first story will remain in the dark corners of her closet to protect everyone. After all, she writes romance, not horror. Just kidding! It’s not really that bad, but her idea of romance and love has certainly changed through time, not to mention her writing skills. Growing up in a traditional and strict family, Lena was protected—or maybe overprotected. Books became her escape, her only avenue to see the world beyond the walls of her shelter. It wasn’t long before she realized that romance was the way to go. No matter how difficult the characters’ circumstances were, by the time the book ended, everything was perfect. In romance, there is always a guaranteed happy ending. Reality was unwelcomed and Lena devoured books like people eat chips. As soon as one was done, she was on the hunt for another. When reality intruded in her life—like work (ugh! )— and reading other people’s work was impossible, she started daydreaming, creating her own stories. Now, she wants to share those daydreams and passion with the rest of the world. After getting her own happy ending, Lena lives in a small town in Massachusetts with her husband, two girls, two dogs, and three cats, and if her eldest daughter has anything to do about it, maybe a bird in the future… She really hopes not, though. Birds are really, really loud. Her stories have been described as cute and sweet with just enough humor to give the reader an occasional giggle. Happy reading! DJ Hot Pants by Ember-Raine Winters is Live!